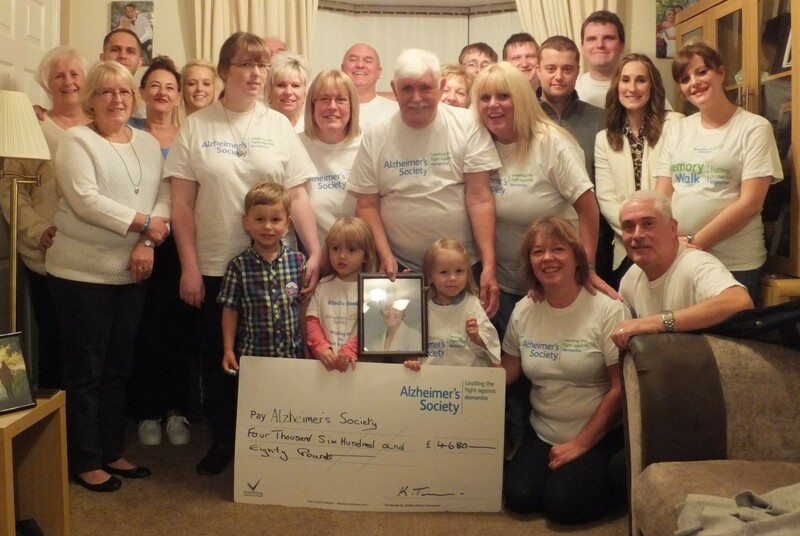 The Turner family, as well as friends, are celebrating after raising nearly £5000 for the Alzheimers Society in memory of Maureen ‘Mo’ Turner who died in January after a long battle with the illness. 27 family members and friends including 3 toddlers and a dog took part in a 14 mile walk (3 miles longer than expected!) around Kidsgrove and surrounding areas that were special to Mo, then onto Bradwell Crematorium where she is now at rest, before turning back. The family would like to say a massive thank you to everyone who walked on a brilliant day. Massive thank you’s also go to everybody who sponsored, it is greatly appreciated. The family and friends would like to give an extra special mention to Nicola Jones who came up with in the idea to do this and Daniel Vernall, Mo’s grandchildren who have both been brilliant in the organisation of this walk for a great cause in memory of their nanna. The family would like to pay tribute to Mo, a wonderful wife, mum, nanna and great nanna. Mo was a lovely woman – loved and missed by many. Anybody who still wants to donate to this very worthy cause can still do so either by speaking to somebody involved with the walk or through their online justgiving site-www.justgiving.com/turners-walk.